(CBS) - Remember the "Alien" movies? When the crew land on the mysterious planet and discovered those strange eggs? I don't mean to sound alarmist, but that was the first thing I thought of after watching the above video. 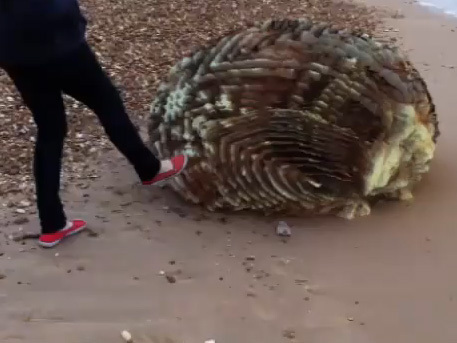 The poster of the video does not help ease my fears with the following description: This massive egg, urchin thing was on the beach at Bournemouth this morning - it stank, my friend kicked it, it was like a massive shell. There was something inside. Now this could be some crazy viral marketing stunt that this blogger has happened to come across by accident, but to add even more layers to this mystery, there are other videos of the same "egg, urchin thing" found on the beach. Super creepy!